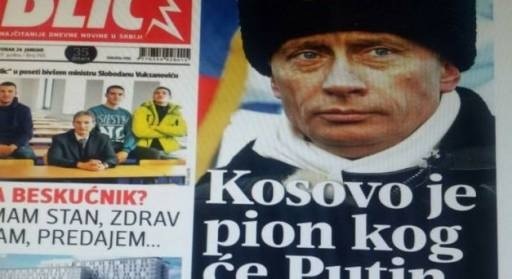 The Serbian newspaper "Blic" writes that a cooling has started between Russia and Serbia and this could lead to Putin's recognition of Kosovo. "Russia has always used Serbia as a springboard for achieving its geopolitical interests. Europe has halped more the Serbian state than has Russia. Of how much Russia defended Serbia is seen in 1999 during the NATO bombing. No Russian soldier died for Serbia," Blic writes. Blic goes on to say that: "Europe has invested in Serbia a lot. If there were not the European investments, this country would have gone bankrupt from many years ago. Only the last 10 years, the EU has invested over 5 billion euros. Europe opens up new factories every day, but also employs numerous Serbs."